Preheat oven to 375 degrees. Combine sliced apples, peaches, 2 tablespoons maple syrup, 1/2 teaspoon cinnamon, and one tablespoon cornstarch and mix well. Gently fold in raspberries and put mixture in a medium baking dish. Set aside. Combine oats, chopped walnuts, sea salt, remaining 1 tablespoon of maple syrup, and remaining 1/2 teaspoon of cinnamon. Using your hands or a fork, incorporate 2 tablespoons of solid coconut oil (or vegan butter) to make a crumble. 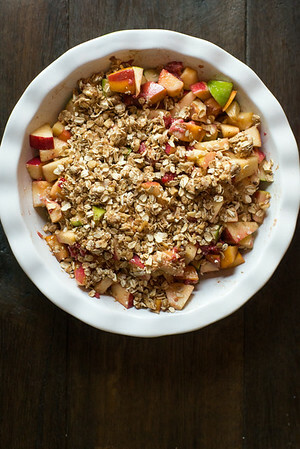 Add crumble to the top of the fruit mixture. Bake for 25-30 minutes until apples are soft. Cool until set and serve warm or cold.  “I like the maple flavor.” —Emily, a grown up.